It’s been called everything from “social networking in a box” to “Facebook without the terms of service,” but until Feb. 16, BuddyPress was a relatively unknown outside the WordPress MU (multiple user) community. The release of BuddyPress 1.2 last month is starting to change that, making it possible to add a social networking layer to the standard, self-hosted version of WordPress (AKA, the WordPress.org install) for the first time. Note: BuddyPress can’t be installed on WordPress.com-hosted blogs. For a breakdown of the different WordPress projects, read more about The WordPress Projects You Haven’t Heard About. So, if you like Facebook or MySpace, but aren’t a fan of the terms of service or other fallbacks of those sites, BuddyPress allows you to set up your own social network for your WordPress site with the features that work for you and your community. And, it’s open source and GPL licensed, just like WordPress. 1. Back up your site/database and install WordPress, if you haven't already. Here’s a review of what the latest version of WordPress offers. If you’re new to WordPress, jumping into BuddyPress isn’t a good idea. Learn the ropes of WordPress before you starting digging into BuddyPress. WordPress.org has a good installation guide if you’re installing WordPress for the first time. Back up your files again in case anything happens during the BuddyPress install. A majority of database errors and site breakdowns occur during upgrades or installations of new plugin or themes – and installing BuddyPress is like doing all of the above at once. 2. 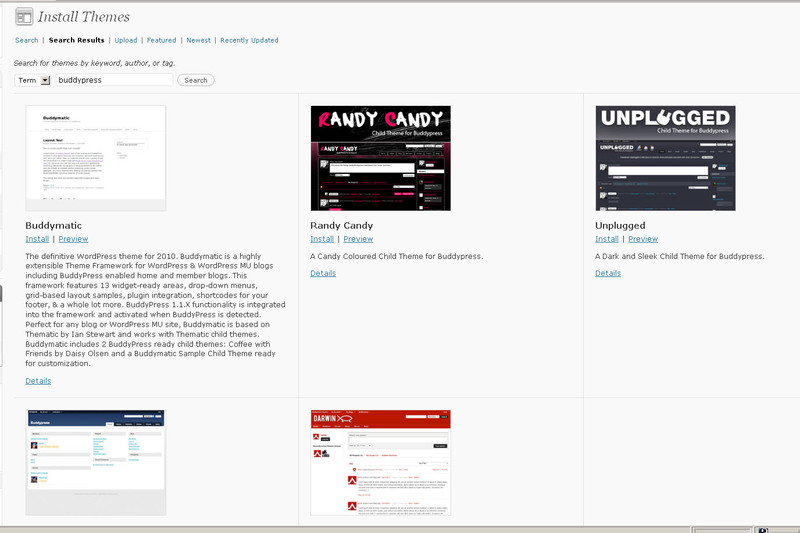 Go to your Plugins page within WordPress and “Add New,” searching the WordPress repository for the BuddyPress plugin. It might not be the first plugin on the list, so be sure to install the plugin entitled BuddyPress 1.2.1 by The BuddyPress Community. After installing BuddyPress from your dashboard, go to “Plugins” and click on the “Activate” link to get the BuddyPress code up and running. You can also download BuddyPress manually, just like WordPress, just make sure you upload it to /wp-content/plugins/buddypress/ on your server and enable permalink support from your WordPress dashboard (Settings --> Permalinks) so that the added BuddyPress pages function properly. 3. Activate the BuddyPress theme of your choice, or use the BuddyPress Template Pack plugin to make it work with your current WordPress theme. This theme simply walks you through the steps of integrating your WordPress theme with BuddyPress, but be sure to double check your theme doesn’t break with the BP install. The first couple WP themes I tried all had issues with the navigation after installing BuddyPress, so I had to go with one of BP’s themes, which I tweaked to resemble my old WP site. The good news being most of what you do with the themes and the BuddyPress Template Pack is reversible and doesn’t affect existing template files. If you’re unsure about whether to add a social networking layer to your site, check out BuddyPress’ demo site to get a feel for what it’s all about. So that’s about as basic as you can get with BuddyPress. To see what you can really do with it, check out some BuddyPress-built sites such as VW Tank Wars, Eco Living and Tasty Kitchen. There’s also a long list of plugins to mold and tweak BuddyPress into a social networking platform that fits your site. For more on BuddyPress, check out BuddyPress.org.